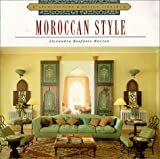 Discover the principles of Moroccan interior design, and learn how to create an authentic Moroccan style living space. Moroccan interior design is a charming reflection of the country's rich and diverse heritage; an eclectic fusion of Islamic and European influences which combine practicality with comfort. Having said that, the Moroccan style is about so much more than just comfort, it's a statement of opulence and grandeur. In order to achieve an authentic Moroccan style space, one has to consider the three main principles of design which are used in that country, namely; colour schemes, contrasting textures and soft, fluid lines. Once these principles have been applied, choosing the right furnishings and accessories can help to create the desired look. 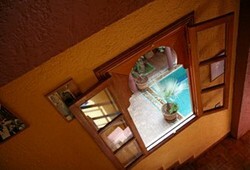 Those who have visited a Riad may have noticed that there can be a stark contrast when it comes to colour schemes. On the one hand, bold and vibrant colours such as vivid red, rich emerald greens and shades of blue, particularly royal blue, may dominate the room. In contrast, muted tones are also frequently used; colours which reflect the desert surroundings, such as beige, taupe and soft browns can also be found. Sometimes these combinations are used together, however, it is not uncommon to see the softer, lighter tones used throughout a room. For greater depth, deeper shades may also be added. Think the colours of spice, rich browns, shades of orange and gold. Contrasting textures are a notable feature in Moroccan design and unvarnished wood is used extensively, alongside smooth and glossy tiled surfaces. Large wooden chests and sturdy tables adorn many of the rooms, in addition, some of the seating usually contains exposed wooden bases. Even though the wood used often has a somewhat rough texture, it is usually ornately carved and decorative. Typically, woods such as argana, cedar and lemon are preferred by craftsman, due to their quality and suitability for making furniture. In accordance with Islamic law you will not find images of living things such as animals or humans incorporated into any design or furnishing, nevertheless, great attention is given to detail, and textures are all important in Moroccan interior design. Beautifully coloured tiles in geometric designs, known as zellinge, are often a central feature in many rooms and demonstrate just how much care has gone into creating the right effect. 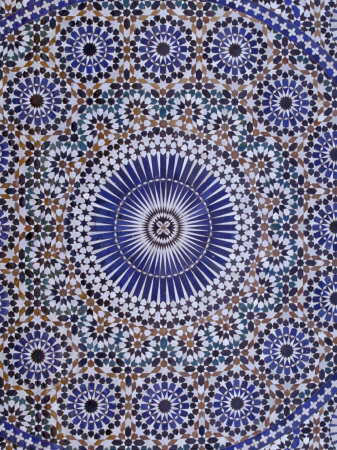 Zellige is a form of tilework, similar to a mosaic, a Zellige is made using tiny coloured chips which are set into plaster and then covered with enamel, which gives a smooth and somewhat glossy appearance. The level of detail involved in Zellinge is really quite breathtaking, and when used to decorate a room can create an almost palatial space. Zellinge and other forms of tilework can be found on floors, walls, in bathrooms, on table tops, around doorways and on fountains. For various reasons, you may not wish to have your walls covered with tiles; to create a more subtle effect, consider using tile topped tables, or tiled wall art. Tadleakt is a type of lime plaster which is frequently used to decorate walls both internally and externally. The plaster is polished and then treated with abrasive materials or stones which gives a soft, smooth appearance. Tadleakt can also be used in wet rooms and bathrooms. The fabrics used in Moroccan design tend to be sheer or lightweight. 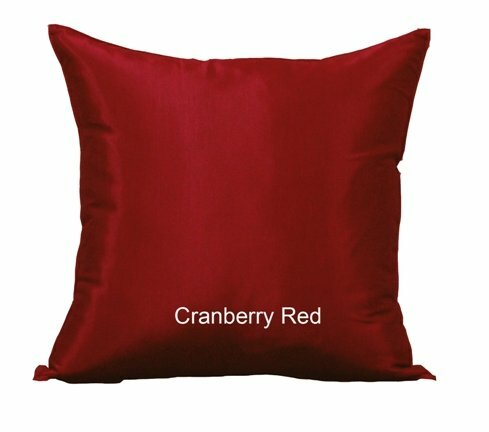 Silk and satin cushions and drapes are frequently found in Moroccan homes, or used as throws to cover seating. When choosing fabrics to decorate your room, opt for transparent fabrics or those which are smooth to the touch. The Moroccan style incorporates soft, flowing lines, and this is where traditional Islamic design is highly prevalent. Beautiful arches and curved doorways adorn many of the buildings and the classic Islamic keyhole design is visible in both the country's architecture, art and furnishings. You can create soft lines by adding accessories which have an ethnic flavour. Choose rugs, wall art, carved furniture and fabrics which incorporate Arabesque and Islamic styles. 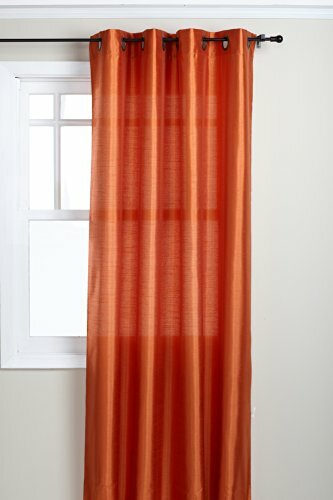 Use tie backs and hooks to drape curtains across your windows masking right angles and hard corners. Once the three main elements of Moroccan interior design have been implemented, Moroccan lanterns and decorative pieces can be added to complete the effect. I'm a color addict, and I love those colors. Interior design is one of my passions. Thank you for the delightful article. I absolutely love Marrakech, the architecture is stunning and the colours! The Moroccans certainly know how to decorate, and they put so much detail into all the furnishings. Mirrors, lighting, wall art, everything is pleasing to the eye. When I visited a colleague at his mother's home in Marrakech, I was most impressed with the wood fittings on the walls - the carving was so intricate. Your article brought back good memories of a remarkable place. I visited Marrakech a couple of years ago and fell in love with the colours and designs. I also recently helped my sister re-decorate her house in the Moroccan style, it is so beautiful. Now her's is complete I'm starting on my own home, bathroom first, then the remainder of the rooms! Moroccan style is lovely isn't it, decadent and luxurious! The Moroccan style of decorating is so beautiful! I'm planning on revamping my bathroom soon, and am choosing the tiles as we speak! The only problem now is how to tackle the rest of the house. Thanks for the warm welcome and comments. Those arches are beautiful arn't they? I love the arched internal doors with the Islamic keyhole design, too. Not possible in my house I'm afraid though, unless I have new door frames fitted. :) Thanks for stopping by and commenting. Nice design. I love the look of arches. Moroccan mirrors and lights are more than just aesthetically pleasing pieces. Learn how to use mirrors and lights to add space, depth and a wonderful ethnic flavour to your home. In the Swedish homes there is nothing allowed to get too cute, frilly or too feminine. However, a feeling of comfort is very important to the Swedes.